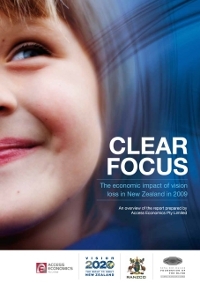 The Blind Foundation has partnered with VISION 2020 New Zealand to produce Clear Focus: The economic impact of vision loss in New Zealand in 2009. Clear Focus identifies that vision loss cost New Zealand society $2.8 billion in 2009, and this figure is increasing each year. Without a focused effort on preventing sight loss, Clear Focus projects a rise in the number of New Zealanders over 40 who have vision loss from 125,000 to 174,000 by 2020. Direct health costs alone would more than double to $523 million by 2020, compared with $198 million in 2009. Conducted by Access Economics, the Clear Focus research looks at the best available evidence to estimate the number of Māori and non- Māori New Zealanders with mild to severe vision loss. A study co-authored by Keith Gordon of CNIB into the number of people who could potentially need vision rehabilitation in New Zealand. Download the abstract for the study (.doc). Download the full study (.doc).